MDF with high glossy painting finishing; attached LED light. Extension dining table, MDF with high glossy painting top and base. Dining chair with chrome base, plywood back with white high glossy painting and covered by foam and PU with stitching line. 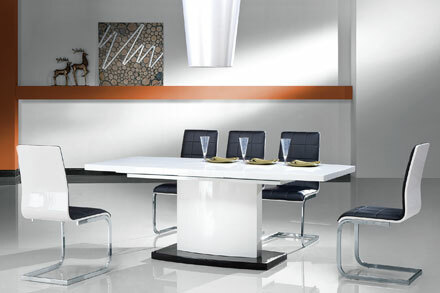 Dining table with 12mm tempered glass with painting; solid wood frame and legs in apricot high glossy painting. Dining chair with chrome base, metal covered with foam and PU material. Dining table, 10mm tempered clear glass top; metal with nickle brushed finishing frame; MDF base with black high glossy.